It’s a powdery, sometimes colorful, mess. 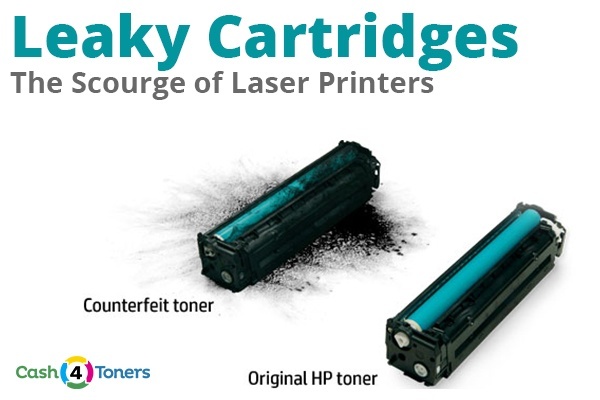 Nothing cramps your printer’s style more than a leaky toner cartridge. But don’t cry over spilled toner. It’s a hassle, not a tragedy. With a little time and patience you can get your printer cleaned up and running again. Let’s do it! Your first instinct when you see a pile of leaky toner dust is to grab your vacuum cleaner. DON’T! Toner dust holds a static charge, and sucking it up with a standard vacuum causes a charge build up that can fry vacuum circuit boards and deliver a nasty shock. If you’ve got a serious spill or anticipate further printer repairs, you may want to invest in a toner vacuum. All of the components in a toner vacuum are grounded to prevent electrical shocks, and the filters are designed to handle minute particles of toner dust. Before tackling this clean up, make sure the printer is unplugged from the wall outlet and has cooled for approximately one hour (components get hot inside laser printers, and you don’t want to burn yourself). Put on your protective gloves and breathing mask. Breathing in toner dust can cause dizziness, fatigue, nausea, headaches, throat irritation, and lung problems.You can safely wash toner dust off your skin with soap and water, but hopefully your disposable gloves will bear the brunt of the mess. Place a piece of paper towel beneath your printer’s cover panel and open the front cover. Remove the leaky toner cartridge, holding it as level as possible to avoid any excess spills. Put the leaky cartridge in a plastic trash bag and tie it closed. We’ve also got you covered just in case you need to clean any toner off of your hands or clothes. Time to clean that pile of toner dust out of your printer. Scoop out as much as you can by hand or with a flat-edge scraper, and wipe away the excess with a dry paper towel. Deposit excess toner and cleanup towels in a plastic trash bag. DON’T USE A DAMP CLOTH OR PAPER TOWEL INSIDE YOUR PRINTER! Liquids may cause toner powder to stick and can damage printer components. The outer surface of your printer is okay to clean with a damp paper towel. If there is any toner dust spilled on carpet, dab it with a damp cloth, use dry cleaning fluid, or use a toner vacuum. Don’t get the spot wet or you’ll leave a permanent stain. Now, it’s time to reinstall your toner cartridge, connect your printer cables, plug it in, and power it on. The moment of truth has arrived! Still getting streaky, dusty prints? You may need to replace your transfer roller. When transfer rollers wear out, less toner makes its way onto the paper. Excess toner gets wiped off the drum and deposited into the waste bin. Once the waste bin is full, there’s nowhere for the excess toner to go but leak from the seams of the cartridge, making a mess inside your printer. Change your transfer roller if you notice lighter copies. Not ready to spring for a new transfer roller? Try switching to a low-yield toner cartridge. A low-yield cartridge will have the same size waste bin as a high-yield cartridge but won’t fill up as quickly and leak toner dust inside your printer. Want to avoid leaky cartridges? (Who doesn’t?) Stick with genuine OEM drum units and/or toner cartridges. Using non-OEM supplies may affect the hardware performance, print quality and machine reliability. Refilled toners also have a higher probability of leaking. Use genuine OEM toner cartridges to avoid future toner leaks and sell you surplus toner cartridges to a legit toner buyback program.